Our founder, Dr. Domenico Lepore, has been invited to talk about Leadership at the national conference of the CIO Association of Canada in April 2018. Here is a preview of what he will saying about the true meaning of leadership. “I would say to the House, As I said to those who have joined the government: I have nothing to offer but blood, toil, tears and sweat. You ask, what is our aim? I can answer in one word: Victory. Victory at all costs. Victory in spite of all terror. Victory, however long and hard the road may be, for without Victory there is no survival”. What is Leadership? Let’s be specific. In the context of organizations, it is about empowering people to pursue a shared vision. why and how it is possible to achieve it. 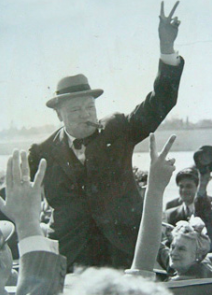 In his famous 1940 speech to the House of Commons that preceded the rescue operation in Dunkirk, Churchill does precisely this: highlights the Vision (“Victory”), the why (“without Victory there is no survival”) and the how (“Blood, Toil, Sweat and Tears”). In our daily work, we may not face the same dramatic challenges of a war and we may not need the inflammatory rhetoric required for those dark days. But, if we want to pride ourselves with some sort of leadership skills, the ones that abound on LinkedIn profiles and that academic institutions sell by the kilo, we must make sure that some of the basics are covered. Indeed, in what follows we are concerned with leadership for organizations. First, a leader owns a Theory, a set of well-tested assumptions within a well-defined realm of validity. Without Theory, Management — that activity we do to achieve our vision — becomes a “whack-a-mole” game and finger pointing becomes the rule. Second, a leader is capable of communicating effectively inside and outside the organization why the Theory will produce the desired results; in other words, the role of the leader is to create predictability of outcome for the efforts he/she requires from their people as well as constancy of purpose among them. Third, a leader is selfless and relentless in elevating everyone’s abilities through continuous teaching and mentoring. How is all this applicable to the work of a CIO? In the early 1980s, American car manufacturers had dramatically lost competitiveness and “Quality” came onto the scene. Quality professionals had a major opportunity to ride the high wave of innovation and systems-based management underpinned by the work of Dr. W. Edwards Deming. Instead, they decided to pummel themselves into irrelevance by hiding behind nonsensical ISO-like quality assurance schemes and surrendering to the statistical hallucinations of six-sigma and Lean. Their major sin was to think of “continuous improvement”, the mantra of Quality Management, as just a set of techniques with no direct connection to business results besides some cost savings. CIOs have a choice: follow the path of the Quality professionals and walk into their own professional sunset, or arm themselves with cause-and-effect reasoning and stand up to the challenge. IT grew up “in the basement” and it has always been considered, at best, a necessary evil. No Top Executive of a non-tech organization comes from IT. CIOs now sit at the table with the big boys and are called upon to deliver the organizational redesign of their organizations in light of what technologies can enable. CIOs must no longer simply “support” the business; they must “be” the business because in today’s world every company is a technology company. The inherent challenge for IT professionals is to “see” the business and be breadwinners. They have a unique opportunity because they are at the helm of the information and material flows that shape the success of their organization. While Agile, DevOps, SCRUM, ITIL, etc. can be useful, ultimately, they are just ways to bypass the fallacies of budget-driven, functional silos and to alleviate the predicaments generated by a hierarchical view of the organization. CIOs are poised to understand better than anyone else what an organization essentially is: a system built on networks of interdependent processes and projects aimed at a common goal. This is the starting point to become a real leader: understanding how to manage an organizational system. We’ll talk about the “how” on April 11th at the event in downtown Vancouver. I hope to see you there. Originally published at www.intelligentmanagement.ws on January 19, 2018.